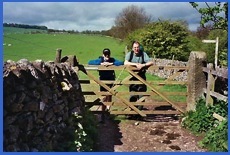 Although I did not participate in the first Peak District Challenge, Mick and I had taken part in numbers 2 and 3 and thoroughly enjoyed them. Here is my report for No. 2 and my report for No. 3. So along with Larry, we decided to have a go at number 4. During the days leading up to the walk there had been low pressure over the British Isles and rain was coming in from the southwest and, as per usual, the weather forecasters' predictions were somewhat "uncertain". We had promises of "intermittent rain", "showers", and "moderate rain". On the day before the walk the forecast said there was a possibility of thunder late in the afternoon on the 19th. However, I don’t think anyone was prepared for the clothes drenching, boot soaking, lake making, cloudburst that hit the walkers before most of them were even half way around the route. Besides Mick and Larry, Greg, my eldest son, and his brother-in-law John had also decided to take part. 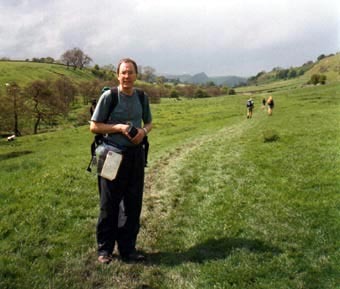 Although Greg has done both the White Peak Walk and Chatsworth Challenge it had been some years since he had done a long walk; he prefers shorter ones up mountains. 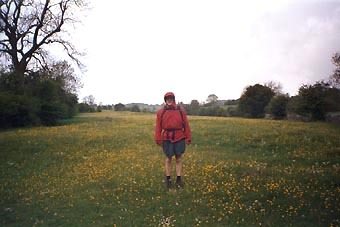 John, I understand, had not done a long walk before so was unsure about how many of the 24 miles he would complete. I dislike doing challenge walks in trousers – can get very sticky if the day is warm - and, like Mick, I prefer shorts. So although the day did not promise to be a heatwave we both considered that if we had the odd shower later on in the day we would be happier having a leg wetting than having to walk along with trousers, plus overtrousers on. Added to this I have size 12 feet and getting overtrousers over them can be difficult. It’s 9 o’clock and we are on our way. The sun is out, I feel fit,and my boots feel comfortable. The only problem I have is getting over some of the stiles that are already wet and progressively getting muddier, slippier and more treacherous after the walkers in front of me have negotiated them. 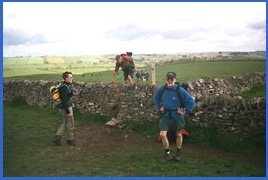 I have noticed in recent years many of the old wooden and limestone stiles have been replaced by ones that are much less of a "challenge" and more easily negotiated by older walkers. I really appreciate "meeting" these. 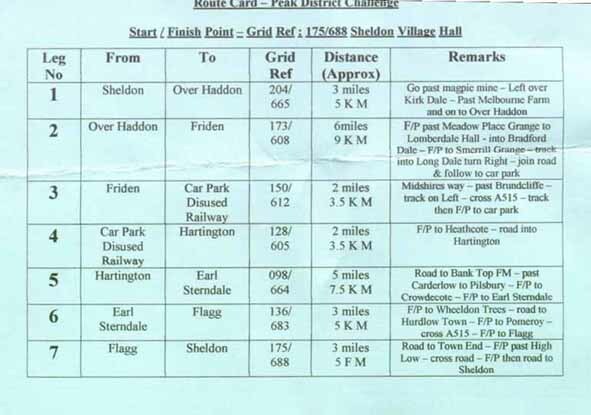 As on previous PDC Walks I have the check points and the main turns loaded into my GPS so I am hopeful that the need to refer to a map will not be necessary. 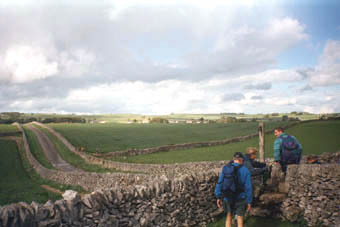 The walk to the first check point at Over Haddon is reached in about 50 minutes. The sun is still out and I’m happy with progress. I had walked up the slope out of Kirk Dale with no difficulty, although, on the O.S. Map of the White Peak Area, it looked to be one of the steepest ascents of the day. So all was well. It was even getting quite warm, so like the rest of our little group, some top layers are removed and deposited in rucksacks. It’s now down into Lathkill Dale. However, unlike previous PDC walks I have done, this time, instead of following the dale up or down stream we go straight across it and up theother side. This is a bit of a "pull", but the zig-zag path makes the ascent considerably easier than a direct route. Mick and Larry are now a little way in front but wait for us at the top of the zigzag We then take the field path through Meadow Place Grange to the top of the hill and meet up with the Long Rake Road. Over the road, over a stile and whoops, nearly went on my back. I told you muddy wet stiles can be a danger. Soon we are at Moor Lane. I have many memories of toiling up this road from Youlgreave when partaking in the White Peak Walk. But today we go straight across it and take a downhill field path. It was about here that Greg said, " I’ve just felt a spot of rain". But it was only a spot and the weather is still good so there is no concern as we pass by Lomberdale Hall and turn left down the steep path which takes us into Bradford Dale. Mick and Larry are waiting at the bridge over the river. Although they probably won’t admit it I think they were unsure which way to go. I am very fortunate that they tend to rely on me to do the navigating so, although I am slower than they are (I am older), they usually wait so I can give them directions. The next stretch takes us up Bradford Dale. 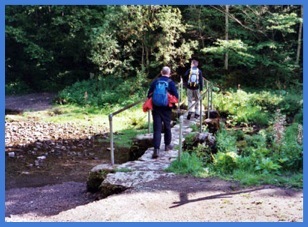 With a group of other walkers we cross the river twice more, as the path swaps banks as it goes up the dale. And just as we debate which way to go at the third bridge it starts to rain. Was it a shower, moderate rain, squall or drizzle? I think it could be classified as drizzle. But it was not even 11.30 a.m. and precipitation was not suppose to arrive until much later. However, it wasn’t heavy and therefore I was not particularly bothered. I unpacked my lightweight waterproof coat, put it on and strolled on. As we reached the lane that would take us uphill to Long Dale the sky cleared and the sun came out and almost all of us took our waterproofs off. Was that all the rain we would get? Wrong. Before we reached Long Dale the rain started again but it didn’t detract from the enjoyment of the views in Long Dale. I was fascinated by the "patterns" on dale side slopes, which I presumed to be lots of sheep tracks! I’d have liked to take a photo but by now my camera was safely packed in, what I hoped would remain, a dry rucksack. August 2009 - Have been informed by Chris Judd that the patterns on the dale side slopes are a result of "soil creep". This happens in lots of steep sided dales, particularly when the soil is not very deep, therefore not a depth of root to bind the soil together. Thanks for that Chris. 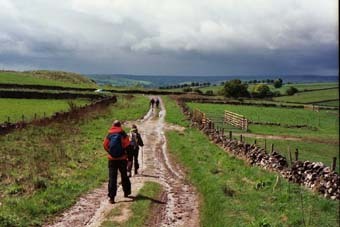 Just as we had left the dale the rain hit us. I can’t remember having been in such a torrential downpour. Seems as if the great weatherman in the sky took a dislike to this part of the Peak District, or maybe he felt we all needed a good hose down. Certainly hosing us down could not have made us any wetter. And then the rain turned to hail. By now we were all in the limited shelter of the trees and I was very much regretting not having long trousers and very waterproof overtrousers on top. As Billy Connelly has put it "there is no such thing as bad weather, only wrong clothing". And although my clothing was appropriate for intermittent showers in no way was it able to cope with mega cloudbursts. The strange thing was though the uncovered part of my legs were OK it was the dampness of the shorts on my legs and area above this that were causing me problems. I was getting hypothermia in my pants! Mick decided to put his overtrousers over his shorts but my shorts were so wet I thought this might have caused a greater problem in the "pants department". So I stood there with others "enjoying" the views until the precipitation slowed down to something slightly less than a cloudburst and then we strolled on. On reaching the road we were amazed at the amount of water coming down it. Clods of soil were being swept away from the verges and we were walking almost in the middle of the road, as walking on the edges would have been the equivalent of wading in a considerable torrent. Then we reached the check point at Friden – 9 miles gone – and the rain stopped. 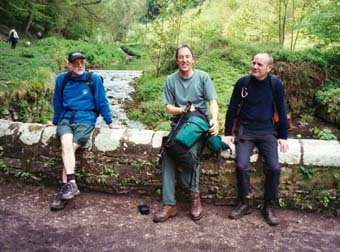 By the time Greg, John and I reached this check point all the biscuits had gone, but there was still plenty of water to drink which, following the weather we had just experienced, seemed superfluous. However, to prevent dehydration I had a drink. Mick was taking his overtrousers off - I gather they were going up and down, on and off all day - and Larry was eating. While Greg and John had some food I partook of a very nice hot cross bun with cheese in. Why do we call them hot cross buns even when they are cold? Answers please to fairweather@brilwalks.com. 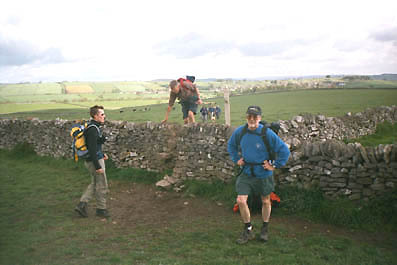 However, by the time us stragglers had sorted ourselves out Mick and Larry were vanishing northwards along the High Peak Trail. of Hartington. When we reached this check point I was expecting to see Mick and Larry. They weren’t there! 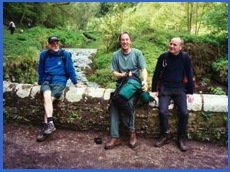 I presumed they had decided to go on without us as they knew that, after the cloud burst in Long Dale, that Greg, John and I were considering whether to continue after we reached the check point at Hartington, which was just over half way through the walk. Yes, I know a bit of rainfall shouldn’t deter you on such ventures, but because of the conditions we were not finding it the most enjoyable walk we had ever done. 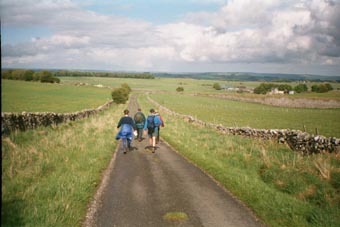 We left the car park and walked towards Heathcote before taking the lane that would take us to Hartington. However, before reaching Hartington and the 13 mile check point we got wet again. Very wet. Which was annoying, as by now I had dried out a little and was now only very damp. Now I’m not sure if this cloud burst was worse than the first, but if it wasn’t it was not very far behind in ferocity. We tried to shelter under some trees by a pond called Heathcote Mere. I am sure the level of it increased while we admired the size of bulrushes in the mere. Certainly lakes were beginning to appear on the road and then thunder sounded in the distance. Greg advised us to get out from under the trees, as it is not a recommended place to shelter if there is the likelihood of lightning. So we continued on our damp journey, with new streams rushing alongside us, to Hartington. One of the first things Greg saw in Hartington were ducks sheltering under cars to get out of the rain. Although rain storms are often referred to as "nice weather for ducks" it seems that even ducks can have too much of a good thing. 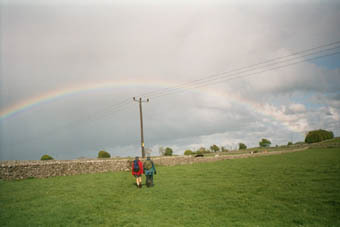 Earlier Greg had been able to contact his wife, Jen, by mobile phone and arranged to meet her in Hartington. We were drenched. It seemed that Mick and Larry were well ahead, We were almost last and feeling very dejected and certainly not finding the walk much fun, so at about 1.45 p.m. we called it a day. I felt very sad about this. I hate not completing walks. However, I felt a little better about it when the lady on the check point said, "I don’t blame you". So I got in Jen’s car, with Greg and John, and was taken back to Sheldon to wait for Mick and Larry. I tried to contact Larry on his mobile telephone, but he obviously was not in a suitable location to get a signal. And then shortly after 2.30 p.m. I got a telephone call from him. 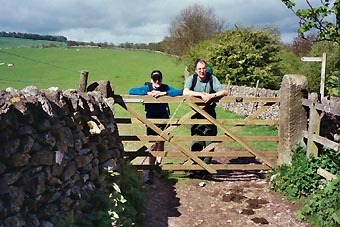 He, and Mick, were about half a mile north of Hartington at Top Bank Farm. It seems that they had missed the turn off the High Peak Trail and were well on the way to Parsley Hay when they realised that they had gone the wrong way. I think it was a matter of presuming that some walkers in front of them were on this walk and they had followed them. When the thunder had sounded they had been on the Tissington Trail going south towards the Disused Railway Station Check Point. Obviously they needed me to navigate for them! So at that point Greg, John and I were some distance in front of them. 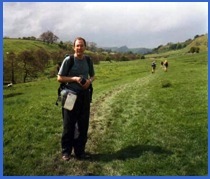 Now for Larry’s view of the next part of the walk – (my comments are the red italics in brackets). Unlike Barry (A.K.A. Fairweather), Mick, who is the spitting image of ‘Uncle Albert’ the sea dog from "Only Fools and Horses" and I love extremes of weather. The thunder and lightning, rain and hail plus Barry’s stories about Vaseline Val and the promise of a lovely home made Steak Pie with new potatoes and vegetables all added to our enjoyment of the day. So much so that at one point we decided that, rather than stick to the quickest route, we would go the long way (for long read wrong) and increase the walk by a couple more miles. 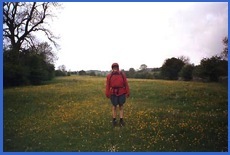 (Like so many walkers they never get lost - just take scenic detours!!) Hardly noticing the rain and hail we skipped our way along to Hartington where I purchased some White Stilton and Apricot Cheese to take back home (Larry enjoys his food). We then left Hartington and took the track to Bank Top Farm. I had stayed "Bed and Breakfast" here in the past and was tempted to pop in and ask if there was any chance of a takeaway. It was one of the best B&B I had ever stayed in. Mick and Larry’s time was 8 hours and 48 minutes. If you want to follow the route in more detail, or walk all or part of it, you will need the O.S. Outdoor Leisure Map No. 24, which covers the White Peak Area. 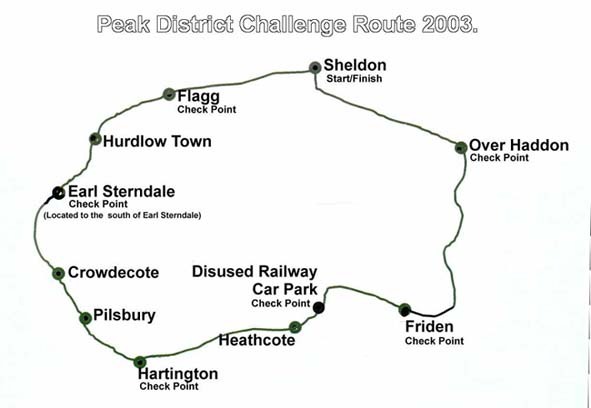 If you want to find out about Vaseline Val and how to prevent blisters you will have to look at the 2nd Peak District Challenge.